BE Writer : Join the BEseries as we host a free dinner and presentation with Fatimah Asghar. 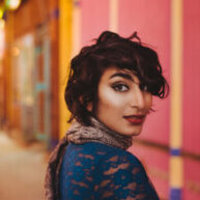 Fatimah Asghar is a nationally touring poet, performer, educator, and writer. Her work has appeared in POETRY Magazine, BuzzFeed Reader, Academy of American Poets and many others. Her work has been featured on news outlets like PBS, NBC, Teen Vogue, Huffington Post, and others. In 2011, she created REFLEKS, a Spoken Word Poetry group in Bosnia and Herzegovina while on a Fulbright studying theater in post-genocidal countries. She is a member of the Dark Noise collective and a Kundiman Fellow. Her chapbook After was released on Yes Yes Books fall 2015. She is the writer of Brown Girls, an Emmy-nominated web series that highlights a friendship between women of color. In 2017 she was the recipient of a Ruth Lilly and Dorothy Sargent Rosenberg Fellowship from the Poetry Foundation and was on the Forbes 30 Under 30 list. Her debut collection of poems If They Come For Us released via on One World/ Random House August 2018. Join us for an evening of food, poetry, performance and inspiration to BE Writer! Presented by: CSI BEseries, ASUO Women's Center, Department of Cinema Studies, Ethnic Studies Department, and Women's, Gender & Sexuality Studies. Fatimah Asghar was a terrific speaker and it was great to learn about her work that embraces intersectional freedoms. Brilliant poetry.